When we talk about roaming, we cannot ignore the beauty of pedestrian bridges which are simply amazing. The pedestrian bridges are basically the man-made creatures but there are some of them which don’t look like one. They cannot be described in words as they are so pretty. 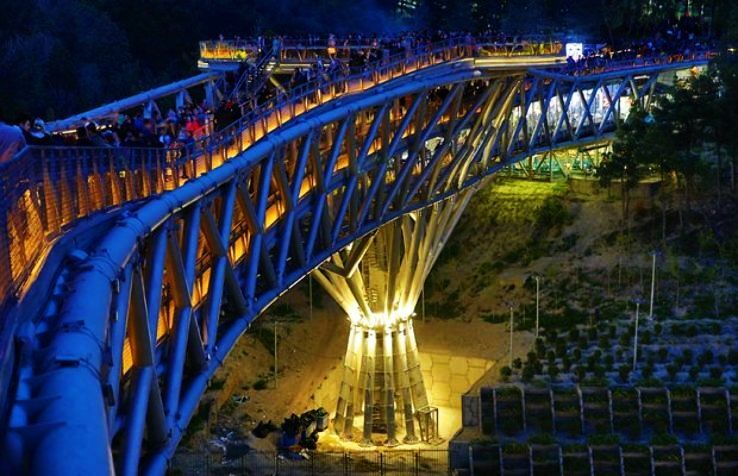 Given below is the list of most amazing pedestrian bridges which are present around the world. 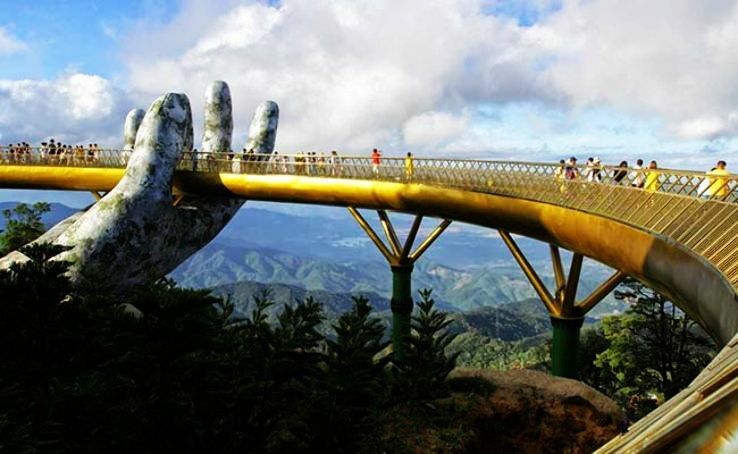 When we talk about Golden Bridge in Vietnam, it actually looks like a dream world. Those two stoned hands holding the bridge, Wow, it is such a unique masterpiece which is just opened in 2016. A number of tourists from China have visited this bridge. It is 1500 meters long and is 1400 meters above the sea level. The green mountains from this bridge are a perfect view and this is one of the most unique creations present in the world. The Sky Bridge, near Sochi in south-western Russia, is a stomach-turning bridge which stretches for around one kilometer and can easily accommodate around 30,000 people at one time. It is also called as Troll wire. It is the longest pedestrian suspension bridge in whole Russia. 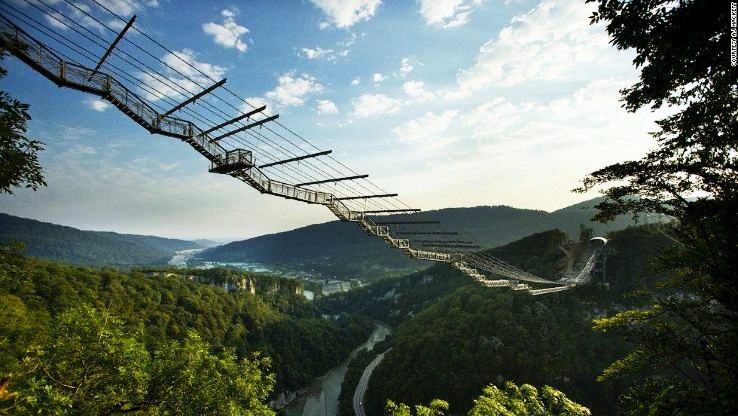 You can even go for Bungee jumping at this bridge if you have no interest in walking. Whatever you plan to do just make sure you go empty stomach at this place. 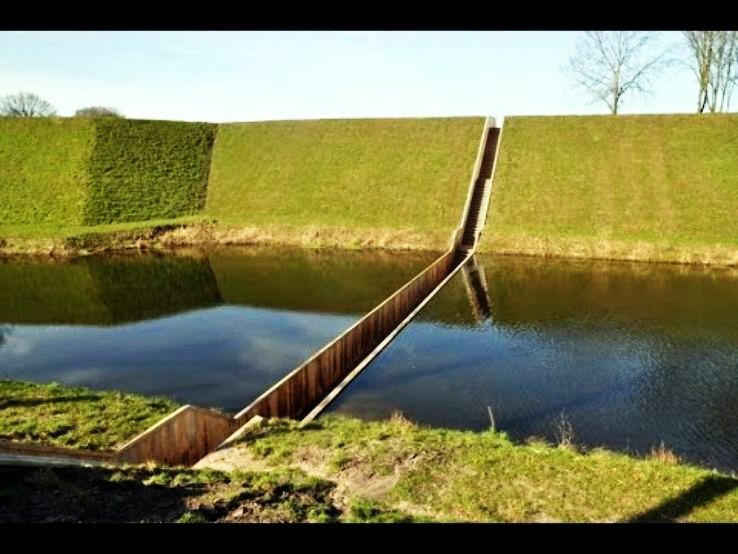 This bridge in Netherland is a world in its own which actually makes to pass through parted water and get into a historic fortress of defense. The bridge is made up of waterproof wood and is beautiful in its own kind. This bridge was made keeping in mind that no flood can affect it. There are adjustable dams on both side so the level of water is maintained. The visitors who come to this place feel no less than a heaven. 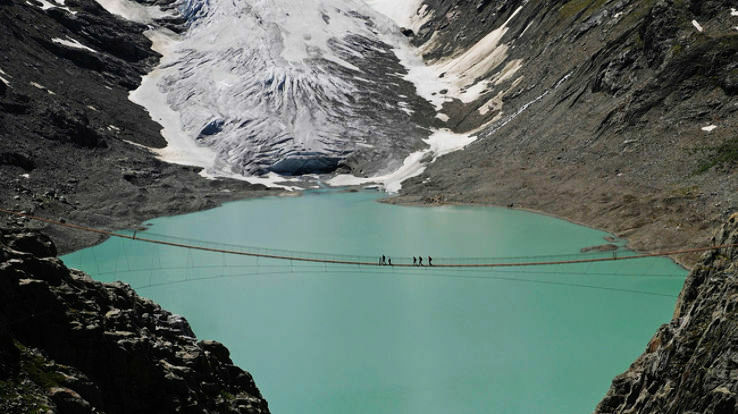 There are a number of bridges where you could cross easily by walking but imagine such a bridge where you bounce or flip to cross and you don’t need to walk? Yes, it may look like a fantasy but it is a fun thing and it actually exists. It is loved by tourist all over the world and this kind of bridge is present in Paris. This was made by architecture firm AZC. In the start, they have sent this proposal and thought it would be accomplished or not but later on, it was executed. The structure comprises three inflatable doughnuts like rings with mesh trampolines stretched across each one which facilitates pedestrians to bounce and reach the other side of the river. Even there is a staircase for the same who do not like to bounce. This bridge is situated in England and its shape looks like an apostrophe. It provides the best thing for people to go from one end to the other. It was designed by the architecture firm McDowell Benedetti which is quite famous. This bridge was completed in 2013. Ponte Segundo Circular Bridge is situated in Lisbon, Portugal and was completed in 2015. It was designed by the MXT Studio. This footbridge covers the whole Second Circular Road in Lisbon and makes a network of connection for pedestrians and cyclists. It is a unique kind of passage which is orange in color and is made up of steel. It is inspired by the local landscape and the farming zone. Peace Bridge was made by Santiago Calatrava’s in the year 2012. It is situated in Alberta. This bridge has a white red path which looks similar to the flags of Canadian and Calgary Flag. This bridge has a path for the cyclist too. They can ride and enjoy. The Jetty to Mont-Saint-Michel is situated in Mont-Saint-Michel, France. The working of this bridge started in 2014. The architect of this bridge was Dietmar Feichtinger Architects. This bridge is a connection between the mainlands to the UNESCO World Heritage Site. There is around a half-mile-long pedestrian bridge. The Luchtsingel Rotterdam, Netherlands was made in 2015. It was designed in ZUS. It connects the north and centre districts of Rotterdam in the Netherlands. This bridge was made to motivate the development and economic growth in areas that had become ignored for a long time. This bridge is a quarter-mile-long pedestrian bridge. It has a wooden structure which comprises planks which has the names of the sponsors. This is one of the most famous bridges in London which was completed in 2014. It was designed by Knight Architects. It is a cantilevered bridge which covers the area of the Grand Union Canal in London. The bridge is made up of five steel beams, which are raised in a motion which looks quite like the opened up Japanese fan. Butterfly Bridge is present in Copenhagen and was made in 2015. The architect of this bridge was Dietmar Feichtinger Architects. Copenhagen’s Butterfly Bridge comprises of three different levels which link the banks of the Christianshavns Kanal. There are two steel spans rose which looks like a butterfly. This bridge is situated in Purmerend, Netherlands and was completed in 2006. The designer of this bridge is NEXT Architects. It has two levels which separates the path for pedestrians and the cyclists. It is beautifully made and has an archway of steps curves above the lower deck, which can be divided to adjust boats travelling on the Noordhollandsch Kanaal. Webb Bridge is a beautiful structure which is situated in Melbourne, Australia. It was completed in 2003. The designer of this bridge is Denton Corker Marshall and Robert Owen It provides a proper path to the pedestrian and cyclist. It is a steel lattice structure which connects the decommissioned railway bridge to the south bank of the Yarra River. This is a delight to see and one can click beautiful pictures over there. Thus, these are the world’s most famous pedestrian bridges which attract a lot of tourists every year.